Heat oven to 400°F. Unwrap string cheese, and cut a 2-inch slit along one side of each, leaving ends intact. 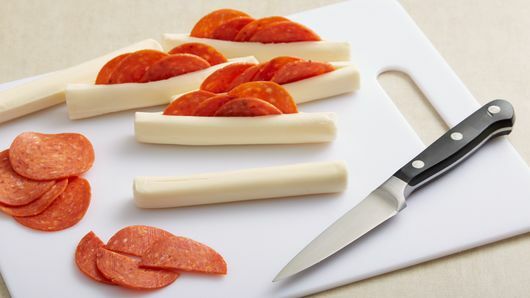 Cut pepperoni slices in half, and insert 4 halves into each cut side of mozzarella sticks. 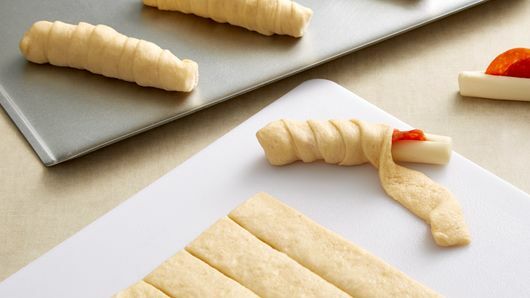 On large cutting board, unroll dough; cut short side into 12 equal strips. Starting at one end of mozzarella stick, wind one strip of crescent dough around cheese, completely covering cheese. Seal ends, and place on ungreased cookie sheet. Repeat for remaining dough and mozzarella sticks. Bake 10 to 12 minutes or until golden brown. In microwavable bowl, heat marinara sauce covered on Medium-High (70%) 1 to 2 minutes or until warmed through. Serve immediately with warm crescent sticks. A pizza cutter works well for cutting strips of dough. Pizza sauce is a nice substitute for marinara sauce. We’ve long believed that you can never have too many ways to enjoy pizza (a.k.a. the world’s most perfect food), and this pepperoni pizza sticks recipe backs that up. 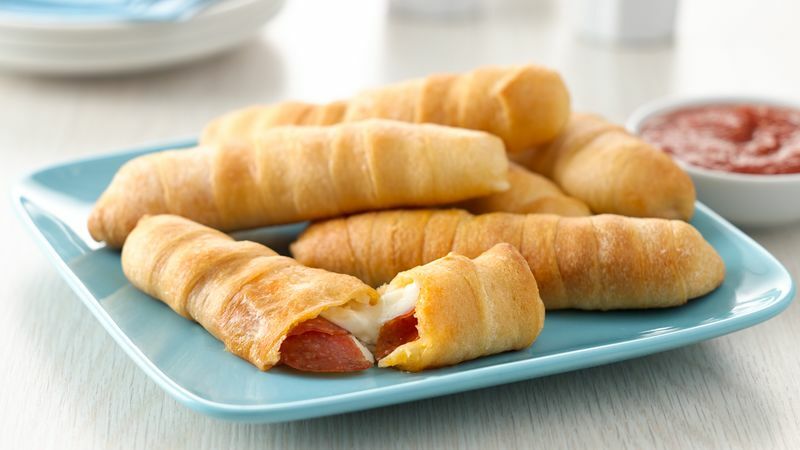 Zesty pepperoni and gooey mozzarella cheese wrapped inside crescent dough make for perfectly dippable finger food that no one will be able to resist. They’re crazy-fast to make and only take four ingredients, so you’ll probably want to make a double batch just to make sure everyone gets their fill of pizza sticks. Because just like with traditional pizza, you’re pretty much guaranteed to want two or three pieces, minimum.